Local shares took another breather yesterday after scaling fresh 21/2 highs earlier in the week amid a quiet day for economic data. The muted session left the Straits Times Index (STI) down 7.8 points at 3,512.68, taking the cue from Wall Street's overnight showing. Major United States indices pared some gains and, with the exception of the Dow, logged their first declines for the year. Still, markets can be forgiven for pushing the pause button after stellar performances that spilled over from 2017. "Upward momentum has shown signs of slowing down ... buying momentum is running out of steam and may soon invite short-term profit-taking," said CMC Markets analyst Margaret Yang Yan. "But the downside is very much cushioned by solid fundamentals and optimism at the macroeconomic level." 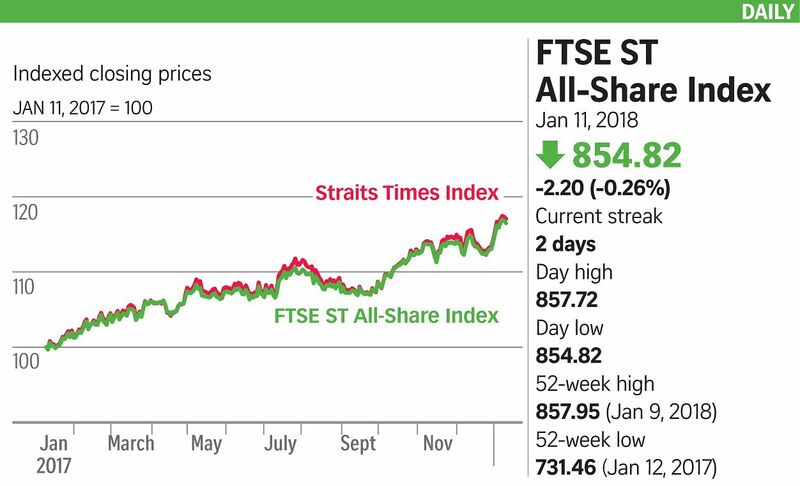 Ms Yang said the STI is likely to enter into consolidation phase with the immediate support level at the 3,500 mark. "This, however, is unlikely to become a major correction as solid fundamental elements cushion downsides. The next resistance level is 3,547, which is the 2015 high," she noted. "Banking shares are facing some selling pressure whereas the offshore and marine sector is well supported by rising crude oil prices, which are at a three-year-high." Trading volume here came in at 3.3 billion shares compared with Wednesday's 1.9 billion shares while the value stood at around $1.1 billion, similar to the previous day's. Losses led by profit-taking sent DBS Group Holdings down 10 cents or 0.4 per cent to $26.46 and Singtel off one cent or 0.3 per cent to $3.61. OUE Lippo Healthcare surged 2.3 cents or 19 per cent to 14.4 cents when it resumed trading yesterday. The healthcare group unveiled plans to raise about $79 million through a private placement of new shares at 14 cents apiece to Japanese trading-focused conglomerate Itochu Corp.
Venture Corp slipped eight cents or 0.4 per cent to $22.40. The contract manufacturer, which joined the STI as a component stock on Jan 5, drew a "buy" call from Maybank Kim Eng. The brokerage house expects the company to release a stellar set of results for 2017 and has set a target price of $27.50 on the counter. IEV Holdings fell 0.6 cent or 10 per cent to 5.4 cents. The Catalist-listed company said it was selling its corporate headquarters in Malaysia for RM9.2 million (S$3.06 million), excluding tax.